I sure does and what a simple but handsome design this is. They took the best pages form the 'How to design a dive watch' book and this is it. Large, well readable hands and indices in contrasting colour from the dial and of course the timing bezel. Al cased in a neat package. I wear my, cough, homage every day, very comfortable so. I wouldn't swap it for the Tudor. This is a classic becoming very rare, the Tudor is a remake of another classic. I'm not familiar how this works in Seiko land but have you considered a full restoration? Perhaps by Seiko themselves if they run such a department. Don't know if this will decrease its value though. In a direct comparison you can there are similarities but that my watch is not a copy. The indices are shorter and the bezel is wider, with fatter fonts. The lugs are somewhat wider as well. This is a good thing, this way it's an homage instead of a blunt copy. I'm not familiar how this works in Seiko land but have you considered a full restoration? Perhaps by Seiko themselves if they run such a department. Don't know if this will decrease its value though. I'd like to know about this as well. If memory serves, Seiko does not offer such a service. Thanks for your thoughts on this guys. To the best of my knowledge, Seiko have never offered a restoration service. 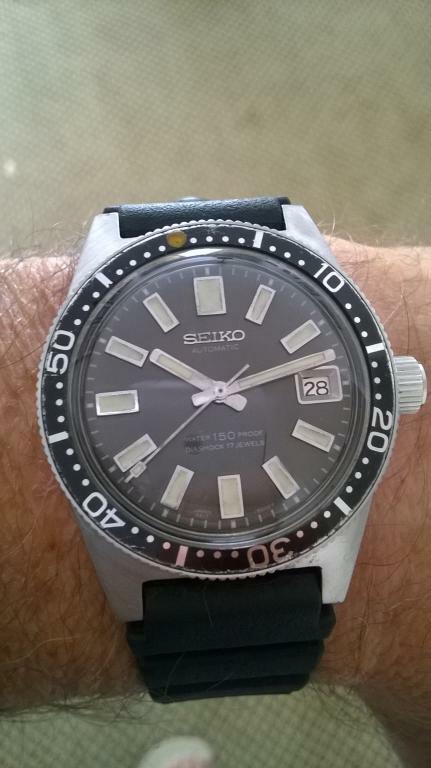 I do know that there are a number of serious Seiko collectors out there that are trying hard to find someone who can make a good reproduction bezel insert. These are always a problem area on vintage watches and divers in particular. A decent condition insert makes a big difference to the appearance of a watch imo. Have you considered one of these -> bezel replacement <- click. Thanks Frans I have seen these and the fit is not correct, neither is the angle. To make them fit they need to have some of the outer edge of the insert removed/shaved off and that puts the digits right at the edge of the bezel and it looks odd. Yes, now I've read it: "The size of the insert is very close to the original 62MAS". But very close is not exact.